HAARP in preparation for upcoming 2012 Planet X “flyby”? HAARP (High frequency Active Auroral Research Program) has many abilities which some are believed to be used for the upcoming 2012 Planet X Flyby. With the HAARP projects advanced capabilities of communication, one can infer that this project can be used to control worldwide panics and global disasters. According to the article, there is evidence of the Egyptians knowing in advance about the Planet X / Nibiru flyby which lead to Noah’s Flood. The Egyptians actively made preparations to survive the doomsday of the Planet X flyby thus could the HAARP project be our modern day preparation for the next flyby in 2012? 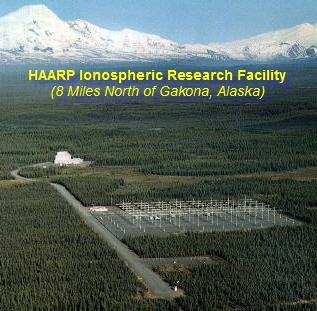 HAARP (High frequency Active Auroral Research Program) is an ionospheric research facility located on a DoD-owned site near Gakona, Alaska. Construction is in the final stages and the site will be fully operational in 2007. Will it be used to control the weather? Consider this. The previous two flybys of Planet X / Nibiru happened during Noah’s Flood and Exodus. New data suggest that the Egyptians knew of the Noah’s Flood flyby some 800 years in advance, and spent 200 years preparing for it. This accounts for the many Flood/Deluge accounts in ancient folklore from around the globe. Could the same be happening today? Could secret societies have orchestrated the creation of the highly controversial HAARP project in Alaska as a way to control panic, fight wars, and mitigate the natural disasters that are sure to attend the next flyby in 2012? Yet if the very force generated at Planet X passing were not to harm this planet, it’s Wormwood would indeed do so …. Wormwood …. A crystallized wormhole portal dragging through space and time, as an anchor chain dragging through the sea of space. This is what the Planet X brings in it’s passing … the anchor’s crystallized tunnel does much damage not only to what we can see in distance space … but it’s damaging drag penetrates through even those celestial colony’s unseen pockets of space which orbits also within this solar system … yet this Crystallized Wormhole doest not extend from Planet X itself … but from that Lighted glow that travels with Planet X … these types of lighted glows in their creations are first referred to as a double hull Lunar Facility …. In proper working condition, such Lunar Facilities develops into a beautiful white Light as bright as our sun, but gives no heat ….. These are referred to as a Morning Star … because of this dragging crystallized tunnel … Earthens and Celestials associated with this solar system are in grave danger … Now comes the Destroyer !! Thank you for that thoughtful comment. I do have a couple concerns, if what you say is correct, how does this fit into the theory of the Anunnaki? I might not be understanding you completely but if one proposes that Planet X is part of a separate dimension (or alternate reality), this does not explain how conventional thought of Planet X is the homeland for Anunnaki because they would not be on the same plane of reality as Earth’s inhabitants. Many Planet X theorists say that the recent visits by Extraterrestrials are actually the Anunnaki checking in on us, and if your theory is correct, this would debunk it. Also, this “wormwood” that you speak of is a very interesting concept. Has this “wormwood” always followed Nibiru / Planet X, or is this a recent development? The reason I ask is there has been recent research that has shown that Planet X has had at least 2 flybys in recorded history and has lead to global disasters but has not “harmed” the planet as you say… maybe I am taking the term to literally. Please clarify. Imagine an oval bubble big enough to hold a planet, a sun-like source of light, a celestial sky-based colony and a ground-base developing nation of people …. Now imagine that bubble to be situated out in space visible to every on looker … imagine that bubble filled with the purest and sweetest of atmosphere …. now imagine the very outer surface of that bubble to be quickened and crystallized …. Causing the bubble to no longer been seen …. And situating the bubble and all that is in the bubble, in a higher dimensional reality … yet the bubble sits in the same space it was once seen …. This is such a place where Planet X sits …. Now imagine …. The sun-like source of energy sitting high up in the open ski of this bubble … to have activated and open a wormhole portal which reached through time and space from whence it set, unto the outside are of darken space … now imagine a specific catastrophe having caused the very wormhole to crystallized and solidify … it is this now solidified tunnel which drags through space attached to the bubble …. That SoD guy sounds like a fruitcake. Excuse me, but where’s the science? Use your eyes for science, look at the weather, see the volcaninc eruptions etc. The end will come swiftly, like a thief in the night. As the never ending voice of reason, i feel that i must point out the complete lack fo evidence in support of the Planet X hypothesis. Yes, it is a hypothesis, because it has never had an ounce of evidence to support it, and thus has never been ratified into a theory. If such a body were aproaching Earth, even still 3 years distant, the gravitonic fluctuations would already be affecting us. It has been sujested that the increased tectonic reactivity is an indication of this, when in fact the earth is more stable than it has been in decades, The only reason we have the illusion that more is happening is because the media has arranged a constant barrage of footage and stories regarding common phenominon, and people are too poorly educated to actualy look at the processes behind them. It is a proposed hypothesis that other planetoids may exist withint the orbit of our star, but they would be beyond the Ort Cloud, and any elyptical orbit that would possibly being it close enought to affect us would undoubtably destroy the planet in the process. Furthermore, the idea that the gods were aliens, although comforting, is highly unlikely. It is more likely that humans share a form of joint conception of the universe around them, prehapse bordering on Carl Jung’s Collective Unconscious. There is something to be said for the strange rise of human civilization, and the development of religion along with it, but it is far simpler to explain it in terms of language and the need for a common point of referance than on Aliens. Work smarter, not harder. And even supposing that the Annunaki and their counterparts in the other foud Progenitor Nations were indeed hyper advanced beings from another world, factoring into account the scientific impossibility of a Planet X at least within the boundries of the Ort Cloud, they would be a species who had undoubtably developted faster than light travel, a process next to impossible by our understanding of the universe. As such, any supposed conflict with them would be proposterious, as the energy required to FTL alone would be enough to atomise the entirety of the Solar System.